number, VIN and production information. There are two different systems of numbering RC30 frames. One system is Honda’s own serial number system. The other uses the VIN system legislated by the country where the motorcycle was to be marketed. VIN is an acronym for Vehicle Information Number. The VIN contains some basic information about the motorcycle whereas the serial number system contains very little information. All frame numbers are stamped on the headstock on the right side and read from top to bottom. In addition to the headstock marking a metal plate is riveted to the frame rail except for the Japanese market bikes. The metal plate has the same VIN or serial number stamped on it. There are a variety of metal plates that vary by intended market. Other information may be shown on the riveted metal plate such as tire size and air pressures, engine size, and vehicle type designation. The US spec machines do not use a riveted on metal plate; they use an anti-tamper sticker on the frame rail serving the same purpose. If you have a frame with an attached metal plate but no headstock stamping it is likely the frame has been replaced. If you have a frame with only the headstock stamping but no metal plate you either have a re-stamped headstock or the metal plate has been removed. If you ever see a metal plate attached by pop rivets be wary. The metal plates are always attached by a brass rivet that resembles a tiny spiral nail. I would walk away if I ever saw pop rivets unless the guy has a valid documented reason for messing with such an important part of an RC30. Frames may also have other decals/approval stickers to indicate compliance with the destination country’s noise or emissions legislation but these are always in addition to the ID plates, where used. Just to make things interesting Honda attached a serialized plate to the left side of the Japanese market machines. I call it a vanity plate, I'm not sure what Honda calls it. This plate is located on the main lower frame casting near where the left rail meets the casting. Due to the holes needed for the rivets to attach this plate some early non-Japanese market RC30s may possess the holes, but no serialized plate. I suppose someone lost track of how many they needed to drill holes in. Australian and New Zealand market bikes often have the holes sans 88xxxx plate. Note the sequential number of these plates does not jive with the frame or engine numbers. Regular production RC30 have a unique model/year/sequence identifier. The only way RC30 crankcases would not have numbering is if they were purchased over the counter from Honda. Early over the counter new crankcases may have the prefix portion of the engine number, but not the sequential number portion. The later over the counter crankcases had no stampings on them. The Honda RC30, like most any motorcycle, uses an alphanumeric system to identify both the frame and the engine. The engine and frame numbers do not match as they do with some motorcycles. It is, however, possible that the numbers could match. If they do it is an anomaly or someone has stamped previously unstamped new crankcases to match the frame. The only ways to determine if the engine is original is by very close inspection of the engine and frame if the engine has never been removed or even better, to see original purchasing documents that would show the engine number when it was sold. Serial numbering also changed to VIN numbering for some countries during the RC30’s production span. VIN numbers, now very common, were still not very widespread in the late 1980s. Only intellectually advanced societies like Canada were cottoning on to this new way of doing things. Digits 1 to 3: The manufacturer and country of manuf. (JH2 Japan / Honda). Digit 9: The check digit (1 to 9 and X). This is a mathematically calculated “digit”. Note that Spain uses the number 0 (zero) here for 1989 where other VIN codes used the standard K letter. Spain used Honda’s serial number system for 1988 so this only applies only to the Spanish RC30 made for 1989. Digit 12: Essentially the year, again by use of the following table. Digit 13 to 17: This is the sequential number in production. As you may have gathered digit 8 is very important. If you are buying an original US model RC30 it is advisable to purchase one that has a zero, not a one in position 8. The California bikes were heavily restricted with castrated camshafts and lean burn carburetors. The low lift and duration cams are reflected in the California spec tachometer that redlines at 12000RPM. Most other RC30’s have a 12500RPM redline. To make the cut a little deeper Honda put soft valve springs in. If you derestrict a California bike you have to change the valve springs also. California market RC30s also had evaporative emission controls that do not hurt performance outside of the extra weight. All US bikes had the air injection pump that injects air into the exhaust port of cylinders 2 and 4. This air pump does not hurt performance other than the extra weight of it. The cylinder head is the same performance wise as a cylinder head without air injection. Approximately 19% of US production were California smog bikes with the remaining 81% being 49 state / non-smog production. 00008 = The 8th frame made for 1988 for markets utilizing serial numbers. 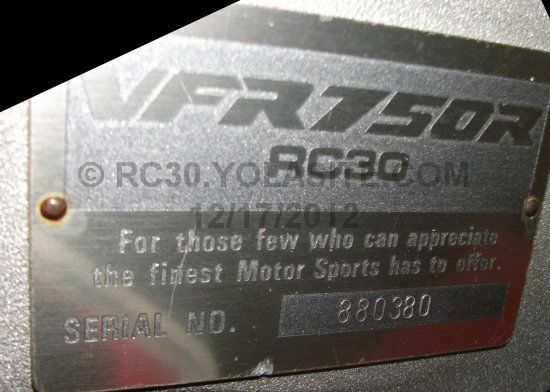 There is no such thing as RC30 serial number 1. What? Why? In reality there are ten of them. If someone claims to have serial number 1 they must be more specific to determine which one in the list they have. The reason is that sequential numbers are reset with the model year and occasionally by market. The following are all of the possible frame numbers that end in “1”. If you have one of these your RC30 may command a premium at sale time. Some of the above machines may not exist. In particular the two listed in red are unlikely to have been sold to the public. The engine number permits on the fly production changes during assembly of the motorcycle. In addition some jurisdictions will record the engine number and the serial/VIN to discourage theft. Like most ant-theft counters it has had little effect. I have my own methods of countering theft that are much more effective. The RC07E prefix for the Japanese market bikes is not a mistake. It is a bit unusual to me as the RC07E prefix was also used on the early VF750 and VFR750 machines (albeit with different suffix series). Click here for a good example. Maybe Honda decided that RC07E did not sound correct so the remainder of the crankcases start with the more appropriate RC30E. The engine number is located on a flat surface on the right side of the crankcases beside number three cylinder. There are some other stampings on the crankcases but these only relate to the crankshaft main bearing bore diameters. These four letters (from left to right) are stamped on the right side of the upper crankcase half behind the primary drive gear. If the crankcase main bore codes are not stamped there have a look look at the small raised pad at the very rear of the upper crankcase half. This small raised pad was originally intended for that purpose. The RC30 was produced for a four-year model run from 1987 to 1990. Occasionally you will see an RC30 advertised as a 1991 or later. The reason for this can usually be traced back to the date when the machine was first registered for the road. Ridiculous to me but I am not yet a bureaucrat writing legislation. 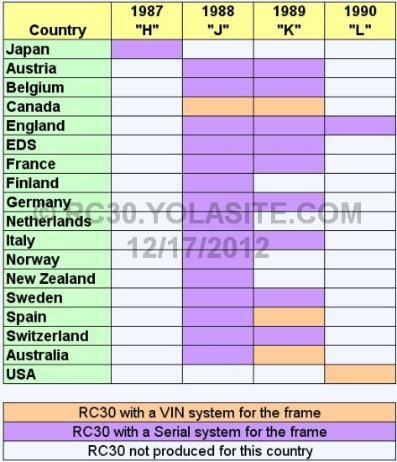 This table breaks down what year each country received RC30s. This list is what most people are probably looking for when they think of RC30 numbers. The necessary information was gathered from a multitude of sources including Honda and my own records. It will provide a guide as to how much difficulty you may have when searching for one. 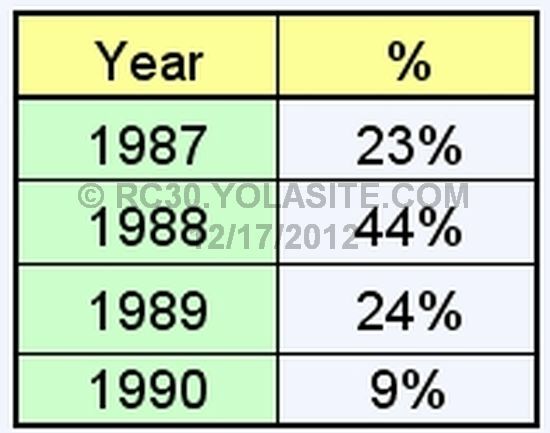 This table indicates the amount of RC30s built each year in percent. As you can see 1988 was when things got serious. Just in time for the new Superbike rules. The 1987 production was all for Japan. The 1990 production was mostly for the US, but exactly one hundred1990 (L) models went to England to replace the much used and heavily crashed RC30s. I compiled some numbers I found on the net and made a couple of graphs to permit a visual look at how many RC30's are registered in the UK. The two charts are the same up to 2006. After 2006 the bureaucrats in the UK, of which there are many, figured out how to generate more paperwork by requiring all bikes be recorded in their system whether they are registered for the road or not. They decided to call this a "SORN" which stands for Statutory Off Road Notification. I can only assume there is fee for this new service. A couple of things can be gleaned from the graphs. First of all the amount of RC30's being ridden is decreasing. It appears to be about 5 less road registrations every year. Even though the graph is for the fourth quarter when most RC30's are not ridden the data for Q2 is similar with respect to the reducing road registrations. The availability of parts has a lot to do with this, as well as collectors purchasing the bikes. The next thing I noticed, and maybe the data is a little sparse for this, is that the total road registrable RC30's in the UK is fairly constant at about 210 machines. This supports the collector and parts availability idea. It doesn't appear a lot of RC30's are being crashed into total losses, or exported. It is also interesting to not that about 40% of the RC30's sold are still road registrable. The unaccounted for 60% would be taken up by crashed bikes and bikes that were never registered for the road (0 mile bikes and race bikes). This indicates that the quantity of road registered bikes is dropping at 5.375 bikes/year.